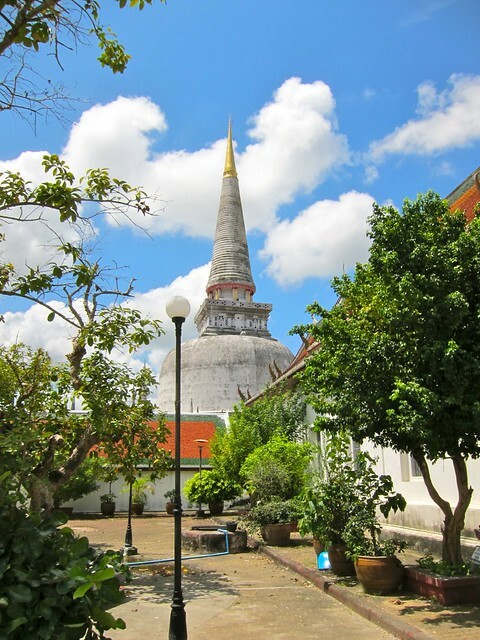 Wat Hopping in Nakhon Si Thammarat – snackettes. After a few days in Trang, we’d thought we would head north again and trek around Khao Sok National Park, a huge mountainous area spanning between the east and west coasts of South-central Thailand. 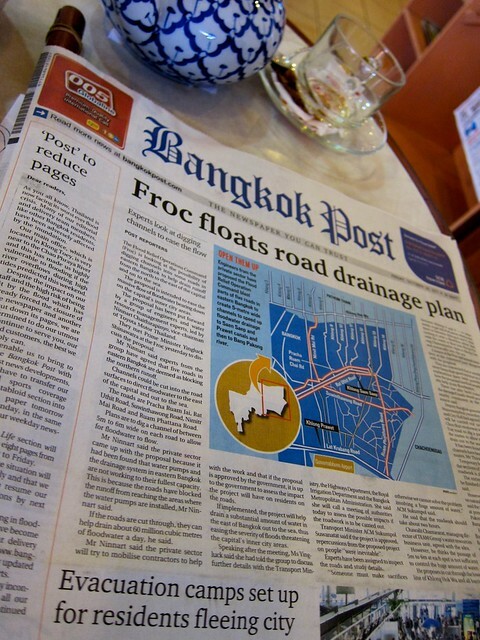 Unfortunately, the train we’d planned to take to the park was no longer running due to the tragic flooding that has been taking place at the other end of the line (in Bangkok and parts north); for us, this was only a minor inconvenience, but we still needed to change our plans. 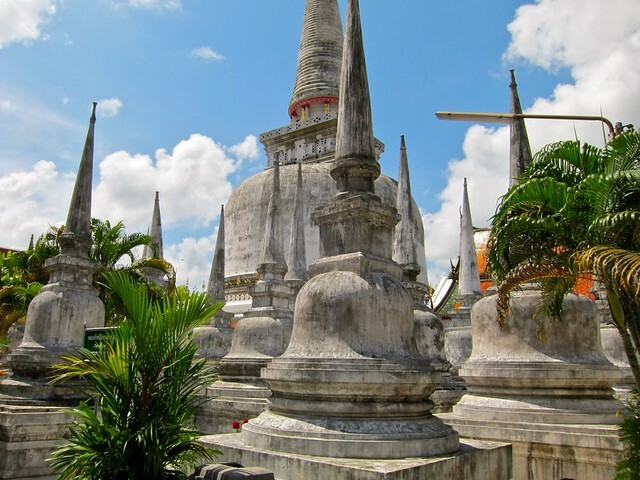 So we scanned our guidebook and decided to head to the gulf (east) coast instead, taking a chance on a small town called Nakhon Si Thammarat, a town apparently full of history and religious sites. Fortunately, as it often seems to do, spontaneity ended up paying off! Anyway, like most city transfers in Thailand, it was easy for us to get from Trang to Nakhon via minibus. For the ride, Steph purchased “Peking Duck with Sauce” chips – Asia seems to have a disproportionate number of meat and fish flavored snacks. Even more so than Trang, Nakhon Si Thammarat is still well off the typical Thailand tourism trail. This was made clear upon our visit to the tourist information office the day we arrived, where the bored folks working there were notably excited to see Americans in their town (the only ones they’d met in at least a year, according to them). We had just spent about half of an hour chatting with them about Nakhon and its cultural sites, and just as we were about to leave, they kindly offered us some delicious coffee and tea, sending us into another round of lively discussion and some time helping with their English. The main person helping us, “Marvin”, was excited to tell us that he had been to America before– only to Wisconsin, he said. At least it had been during the summer! We found the lack of tourists to Nakohn pretty surprising, as Nakhon has quite a lot to offer, especially its many ancient Wats (Buddhist Monastery Temples). In fact, Nakhon is home to the largest and most important Buddhist monastery in southern Thailand, Wat Phra Mahathat. We spent a good portion of a day wandering its grounds. 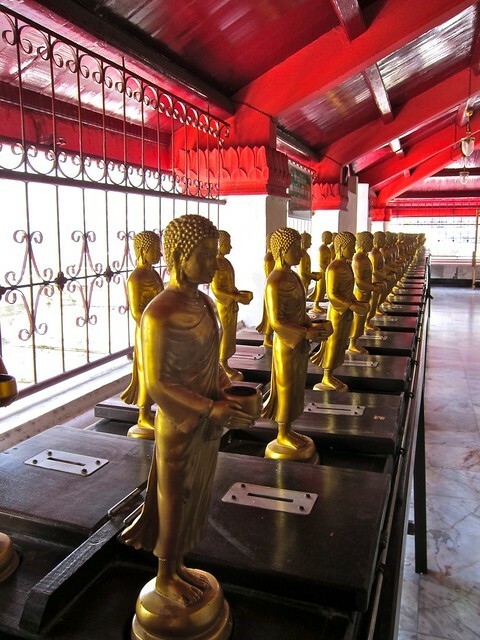 The entire facility was bordered by a hallway containing 173 life-sized gold Buddha sculptures. Beautiful old chedis dotted the interior courtyards of the Wat. 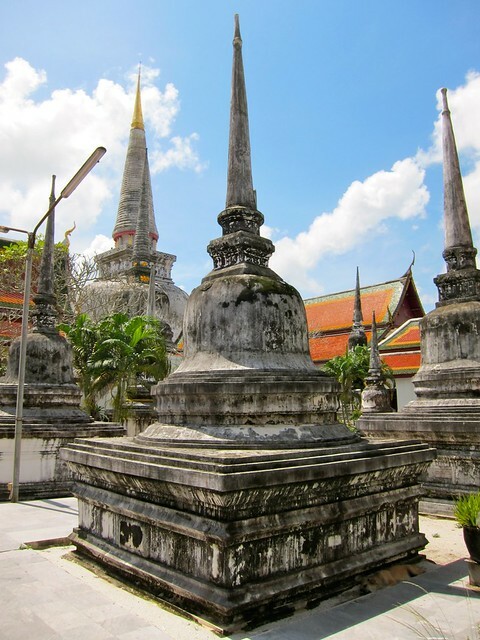 The inner building surrounding the main chedi of the Wat contained statues, ceremonial instruments, and rows of coin boxes that followers methodically walk along, dropping a coin into each for good luck. It’s common for followers to plaster the statues with flecks of gold leaf. Along the way, we met some high school students who apparently walk around armed with a piece of paper listing English language questions to ask, should they happen upon an English speaking farang (foreigner). Here we are together after they polled us on our names, ages, and favorite Thai foods. 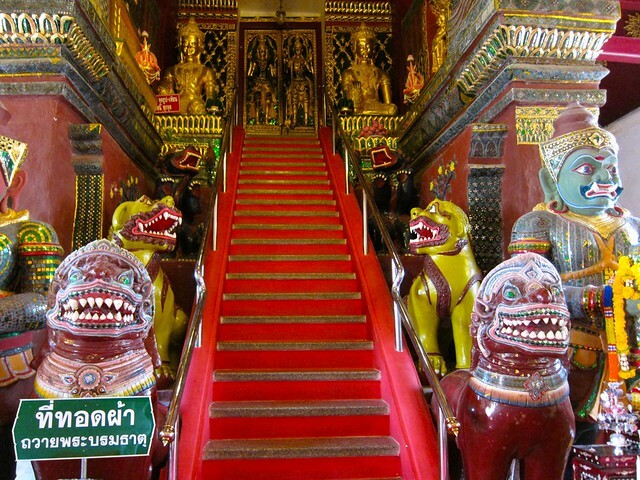 This staircase led to the innermost area of the main chedi. It wasn’t open at the time we passed through, unfortunately. Banyan trees, sacred to Buddhists, are often found decorated like this. The monastery appeared to be closed when we arrived, but after wandering around back and chatting with a guy cleaning the grounds, we were let in to see the interior, which houses an enormous Buddha statue. Because the monastery was closed to the public, the only light available filtered in from some nearby open windows, and the enormous room was perfectly silent, save for a few birds outside. Aside from a few napping monks in the back entryway, we had this beautiful place to ourselves. 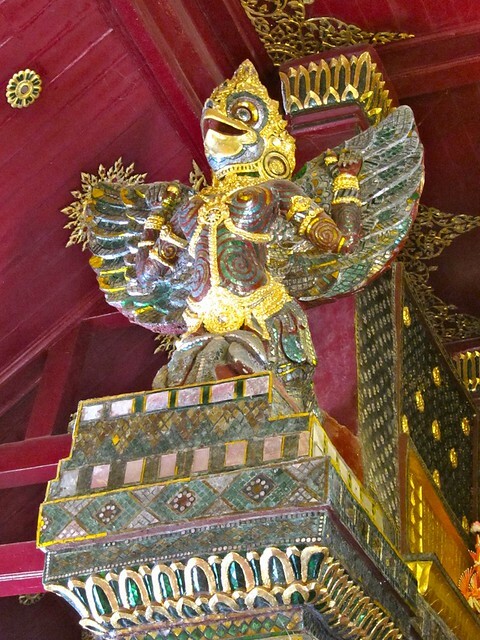 As if the Wats weren’t enough, Nakhon is known for another important bit of cultural history in southeast Asia: it’s one of the lasting hold-outs of the ancient art of shadow puppetry! We visited the home/museum of Thailand’s best and most celebrated shadow puppeteer and puppet maker, Suchart Subsin, to take a look at what he and his son make. Unfortunately, we weren’t able to catch a performance – Suchart was taking a nap on the table while we walked around admiring his work – but we did get to see some pretty intricate – and some very old – puppets. The puppets are all hand-made of pounded animal skins, and the designs are incredibly detailed. Also of note: Scott made use of both the hands-down toilet and the shower at the puppet museum. It is unclear if we are welcome back. Shredded and fried catfish with mango/lime sauce. 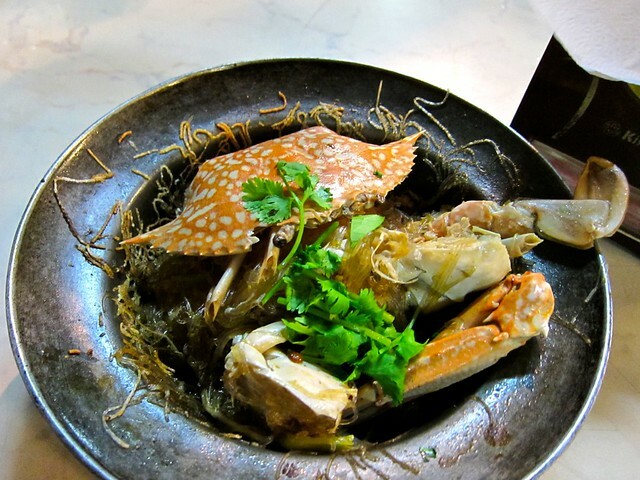 Whole crab with glass noodles and peppercorns. 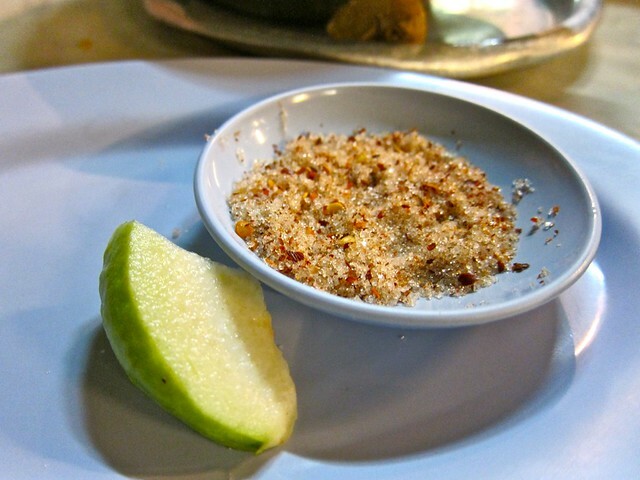 A sort of half-pear, half-apple, half-no-idea (and more than half-eaten here) fruit with salt, sugar and dried chillies – an apparently common Thai dessert. 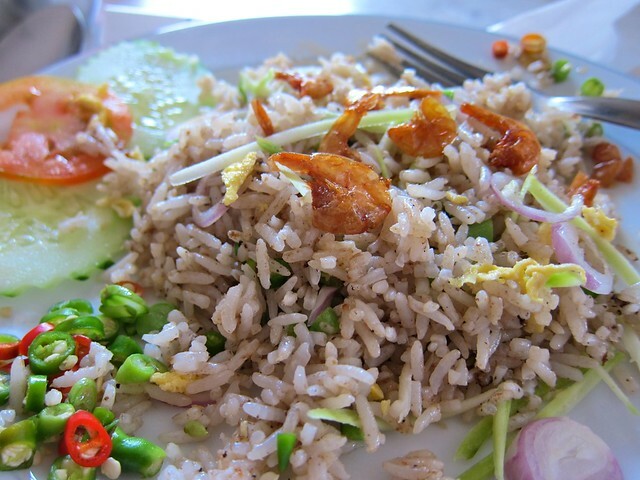 Typical but delicious spicy and fishy fried rice with baby prawns for breakfast. The usual super-spicy chicken and rice soup for breakfast. More night markets lined with carts dishing out all sorts of unusual fare… this lady was cooking some sort of naan-like bread by juggling it back and forth over a fire. 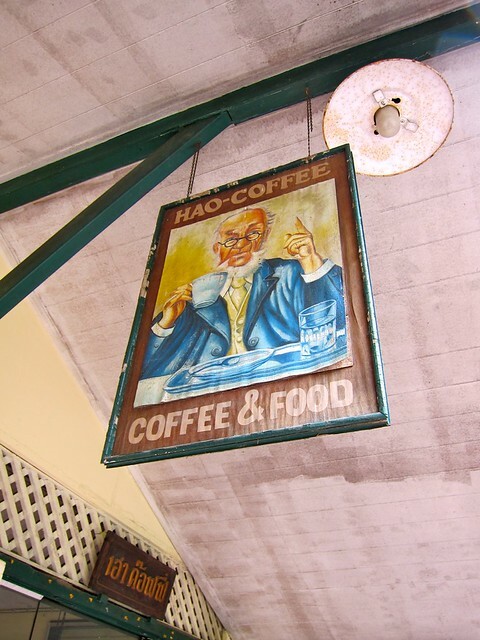 …And REAL COFFEE (not instant like most places we’ve been), including a latte that Steph actually enjoyed (while normally a proud, non-coffee drinker) at a nice little cafe called Hao Coffee. After a few days, we were in the back of a Songthaew (local taxis made from modified pickup trucks) on our way out of town to the next stop. Songthaews are standardly overbooked, especially when kids are riding to school and back. To free up some room for us, the songthaew driver kicked some kids out of their seats and had them hold on to the back off the pickup for the trip to our next stop; happily, they surfed the back bumper, hanging on with one hand, with lollipops in the other while we sped along at 65mph – just another reminder of how different things are in every part of the world. AMAZING BLOG! I was blown away by the vivid colors! You MUST make this into a book!